ADU prices are all over the map. I’ve personally visited basement ADUs that cost $20K, and an ADU above a garage that cost north of $400K. So, it’s not a straightforward task to explain how much an ADU cost to build. The cost of construction for the same structure can vary greatly depending on the builder, as well as what the current cost of labor and materials are in a given region. It will also largely depend on what type of structure we’re talking about. A basement ADU conversion is a totally different animal than an ADU above a garage. These factors all make estimating the “average cost of an ADU” impossible. To further complicate matters, many homeowners defray their out of pocket expenses by putting in sweat equity, particularly during the finishing stages of construction. This labor contribution can help defray some of the out of the pocket costs of ADU development. But, for the purposes of this post, which attempts to explain development costs on an apples-to-apples basis, let’s assume that the homeowner is hiring out the entire job, and not doing any of the work themselves. Since there were a larger sample of detached new construction ADUs than other ADU types, we can examine those development cost samples in more detail. The total cost average was $175K. The cost per square foot range was $162-$480/sq ft. The cost per square foot average was $294 per sq ft. If we plot the costs, a couple trends appear, and an important development principle of housing makes itself evident to us. First, regardless of size, there's a pretty wide range of costs. Note how a couple of the ADUs that are 550 sq ft range in cost by over $75K. Note how the ADUs that are 750 sq ft range in cost by over $125K. This range is hard to nail down, but site conditions, level of finish, and cost of the general contractors are all significant variables that effect this wide range. Secondly, size matters. As the size of the ADU increases, the development costs are likely to rise. This is self-evident, but it’s good to validate our basic assumptions about these things. Thirdly, I’d like to focus on the flip side of this rather obvious conclusion. While size matters, and smaller ADUs can cost less, even very small ADUs are very expensive! These days, I peg 400 sq detached ADUs with a starting cost of $120K for the total development cost. I peg 800 sq ft ADUs at a starting cost of $180K. The costs can go way up from there, but it’s possible, and fairly common, to build an ADU for these prices in the Portland market. Incidentally, here's the cost data plotted for detached new construction ADUs above garages, which tend to cost more because they're typically larger structures. To date, I’ve still not seen a detached new construction ADU built from the ground up that cost less than $80K. There is essentially a fixed bottom-line cost to new ADU development. From what I’ve observed, it is simply impossible to come in at far less than this bottom line $80K price. I have spoken and consulted with hundreds of ADU owners at this point, and I haven’t found any outliers who have figured out how to build a detached ADU for $60K. I’ve also challenged builders that if they could produce any detached ADU for $60K, they’d have a long waiting list of prospective clients. To my knowledge, no builders have been able to meet this challenge. ADUs are expensive, due to the fixed costs of new housing development. For example, excavation, concrete formwork, and pouring a foundation alone typically costs $10-15K. This cost cannot be avoided. From a purely rational, economic point of view, it makes sense to build the ADU up to the largest allowable size (800 sq ft, in Portland’s case), since it’s only marginally more expensive to add square footage. Homeowners are maxing out their zoning entitlements (800 sq ft ADUs) because of the economic rationale to do so. This is likely why, in Portland, homeowners appear to develop more 800 sq ft ADUs than any other sized tier of ADUs. More than 40% of ADUs that are greater than 700 sq ft. 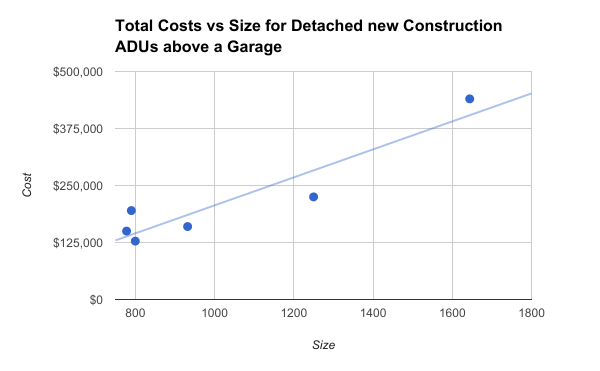 This post has admittedly only scratched the surface of the simple question, “How much does an ADU cost to build?” The costs for ADUs can vary by type, and detached new construction ADUs certainly aren’t the cheapest type to build. We’ll cover more about ADU costs in future posts. And, then we’ll get to the next logical question. If ADU’s are so damn expensive, how do you pay for them?? The short answer is that homeowners typically have to find creative mechanisms to access the capital to pay for the ADU in cash. It’s not like buying a house, where you can easily borrow (aka finance) the money easily from a bank. Although some financing options exist, they’re limited, as ADUs are not yet a common enough product. In reality, most of the time, homeowners must patchwork together funding to build an ADU, and this typically means stretching themselves to their financial limit and beyond. We’ll dive into the most common methods that homeowners are using to finance ADUs in a future post. And, finally, we’ll investigate whether ADUs are a good investment. While they’re certainly not widely considered to be part of the standard lexicon of traditional retirement investments, I’ll toss out there that ADUs are quite possibly one of the best wealth-building investments available. It boils down to this: the land is free. Land is commonly the most expensive part of residential housing development, but in the case of an ADU, the land costs are already accounted for. Each dollar that is spent on the housing unit, is being spent in the actual housing unit. If the ADU is being built to help generate rental income, there’s a fairly direct return on those dollars, in comparison to the development of other residential housing types. When the return on investment is coupled with the lifestyle flexibility and security that ADU offer to an aging homeowner, the benefits of ADUs may suddenly start to dramatically prevail over more conventional, traditional, conservative financial investments. However, one must also realize that ADUs are not a mechanism to get rich quick. ADUs are a fantastic way to build wealth, not to build riches.